Xocomecatlite: Mineral information, data and localities. From Nahua "xocomecatl", grapes, alluding to its occurrence in clusters of green spherules. 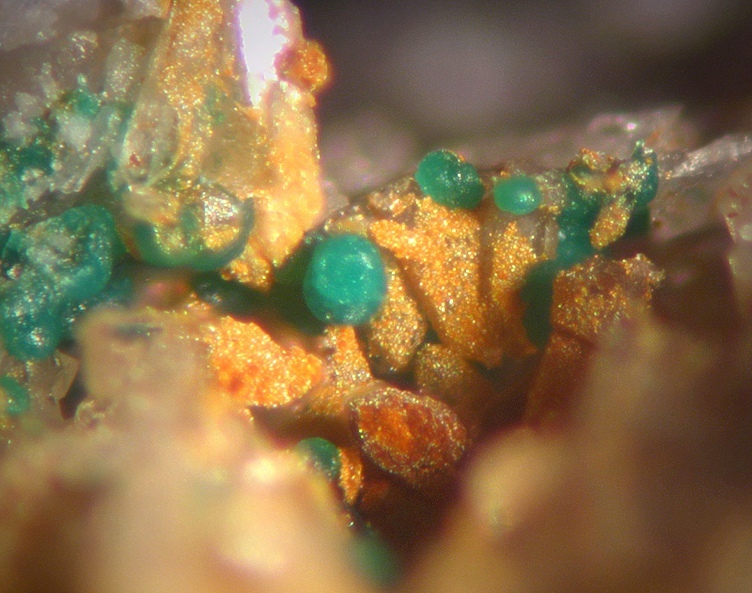 This page provides mineralogical data about Xocomecatlite. 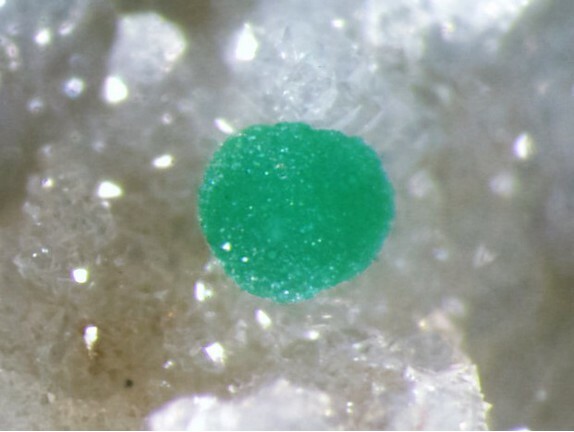 isolated or clustered spherules that seldom exceed 0.15 mm in diameter. These spherules are composed of radially disposed needles that seldom attain 5 micron width. Mcalpineite 5 photos of Xocomecatlite associated with Mcalpineite on mindat.org. Jensenite 3 photos of Xocomecatlite associated with Jensenite on mindat.org. Dugganite 3 photos of Xocomecatlite associated with Dugganite on mindat.org. Eurekadumpite 1 photo of Xocomecatlite associated with Eurekadumpite on mindat.org. Frost, R. L., & Keeffe, E. C. (2009). Raman spectroscopic study of the metatellurate mineral: xocomecatlite Cu3TeO4 (OH) 4. Journal of Raman Spectroscopy: An International Journal for Original Work in all Aspects of Raman Spectroscopy, Including Higher Order Processes, and also Brillouin and Rayleigh Scattering, 40(8), 866-869. Mineralogical Magazine(1975) 40, 221-226; Panczner(1987):136-399. Jonsson, E. (2016). Te-Se-Au-Ag-Bi-rich polymetallic vein mineralization south of Glava, SW Sweden. In NGWM 2016 (p. 132). Anthony, J.W., et al (1995), Mineralogy of Arizona, 3rd.ed. : 209; Williams, S.A. (1978), Khinite, parakhinite, and dugganite, three new tellurates from Tombstone, Arizona, Am.Min. : 63: 1016-1019. Anthony, J.W., et al (1995), Mineralogy of Arizona, 3rd.ed. : 267. Anthony, J.W., et al (1995), Mineralogy of Arizona, 3rd.ed. : 428; Williams, S.A. (1978), Khinite, parakhinite and dugganite, three new tellurates from Tombstone, AZ, Am.Min. : 63: 1016-1019. Collected by Bob Housley. EDS and PXRD analyzed. 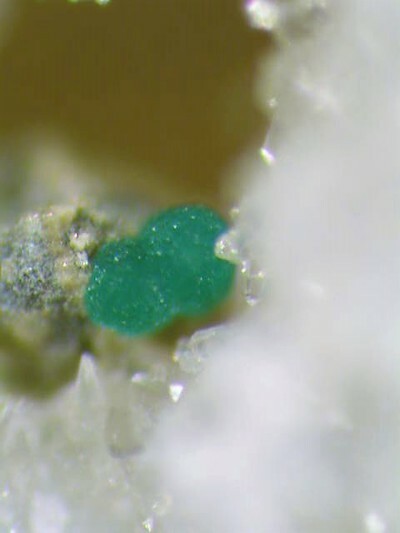 [MinRec 27:464]; Canadian Mineralogist; February 1996; v. 34; no. 1; p. 49-54; Roberts, A. C., Ercit, T. S., & Cureton, F. F. (1994). Mcalpineite, Cu3TeO6. H20, from the McAlpine mine, Tuolumne County, California, and from the Centennial Eureka mine, Juab County, Utah I. Mineralogical Magazine, 58, 417-424.